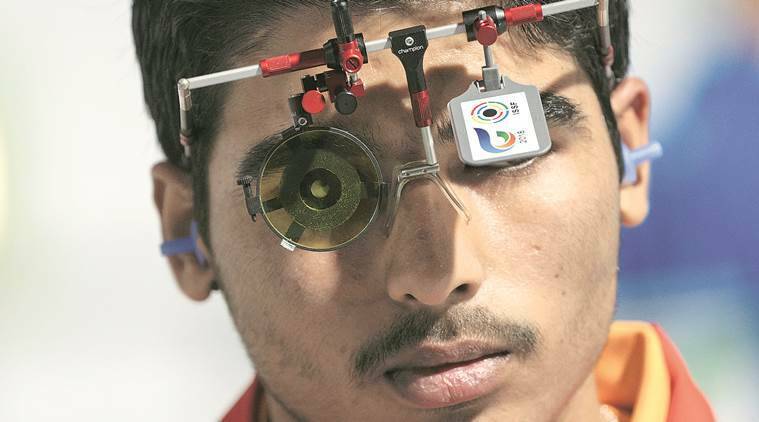 India’s teenage shooting sensation Saurabh Chaudhary continued his incredible run by claiming his fourth individual gold medal in as many months with a top finish in the 10m air pistol junior men’s event of the Asian Airgun Championship on Thursday. The 16-year-old, son of a farmer based in Meerut, first combined with compatriots Arjun Singh Cheema and Anmol Jain to log a total of 1731 to win the team gold and fetched the individual gold with 239.8 in the eight-man individual final to finish with two gold medals. Saurabh won the gold medal at the Asian Games in August, besides bagging golds at the World Shooting Championships in September and the Youth Olympic Games in Argentina last month. Arjun (237.7) secured the silver medal after finishing second, while Chinese Taipei’s Huang Wei-Te clinched the bronze with a score of 218.0 to deny India a clean sweep. Anmol finished fourth with a score of 195.1. The Indian trio missed the World and Asian Junior record by a mere point. Youth Olympic champion Manu Bhaker, however, missed out on an individual medal by finishing fourth in the 10m air pistol final with a score of 196.4. Abhidnya Patil also made it to the eight-woman individual final but finished seventh. Manu had topped qualification with a score of 579 while Abhidnya was placed fourth with a score of 563. Neha was 12th with a score of 552. The Indian women’s Junior team consisting of Manu, Abhidnya Patil and Neha won the team silver in the 10m Air Pistol with a combined tally of 1694 points, going down to team China who tallied 1704 to win gold. India now have 10 medals from the competition with three gold, five silvers and two bronze medals. Earlier, the Indians dominated the qualifying stages with Arjun topping the standings with a score of 578 after 60 shots. Anmol was second with 577 while Saurabh was placed third with a score of 576 and all three made it to the eight-man final.